This week’s menu is all sorts of crazy. Sunday is Easter so I’m looking forward to cooking up all my Easter Menu favorites. I’m traveling for work this week so I’ve flipped some of my workout & meal times. I’ve also got meals planned for my husband and son for while I’m away. I’ve seen a lot of requests lately for healthy meals to mix things up. Many times when people set out to eat healthy they pick a handful of recipes, like grilled chicken, and eat it over and over and over again. It’s easy to get burnt out on eating healthy meals if you are always eating the same thing. Has eating healthy become boring? One of the recent posts in the 80 Day Obsession Coach Facebook Group I’m in asked if people eat the same meals everyday. I was shocked by how many people said they do. It would drive me crazy. I love food and I love to enjoy food. Eating the same thing everyday would burn me out. To keep up your healthy eating habits it’s important to bring some variety to your meals. 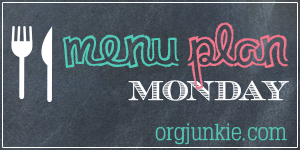 Each of my weekly menus helps you with 80 Day Obsession Meal Variety. I hope they help keep up your healthy eating habits.